Dr. Stephen Crawford is Director of Percussion Studies and Professor of Music History at the University of Mary Hardin-Baylor in Belton, Texas. He holds the Bachelor of Arts Degree in Music Education from Minot State University, the Master of Music Degree from the University of Northern Iowa, and the Doctor of Musical Arts Degree from the University of Missouri-Kansas City Conservatory of Music. Dr. Crawford is the principal percussionist/timpanist with the Temple Symphony Orchestra, and conductor of the UMHB Percussion Ensemble and Marimba Tejas. 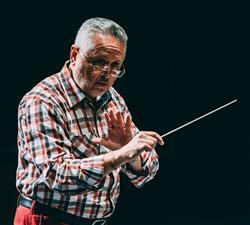 He has held teaching and conducting positions at Temple College, Minot State University, Ellsworth College, the University of Northern Iowa, and was the Associate Conductor with the Kansas City Civic Orchestra. A nationally recognized conductor and scholar of wind and percussion music, Dr. Crawford has conducted performances at state, national, and international conferences including the Texas Music Educators Conference, College Band Director’s National Conference, The Percussive Arts Society’s International Conference, and the International Horn Symposium. He has presented percussion clinics at the Music Education Associations of Indiana, Kentucky, Nebraska, Texas, Pennsylvania, North Dakota, South Carolina, California, New Mexico, Minnesota, and North Carolina. Dr. Crawford is in demand as a percussion artist, clinician, scholar, lecturer, and guest conductor having appeared throughout the United States, Canada, Mexico, Ireland, Taiwan, Indonesia, Scotland, England, the Czech Republic, China, Russia, Belgium, Peru, Netherlands, Latvia, and Estonia. Dr. Crawford lived in London, England as the UMHB faculty member for the London Studies Program for spring of 2009 where he lectured courses in British Music History. His research specialties include wind and percussion music of the Renaissance; the chamber music of Carlos Chavéz; Bell Towers; and Czech music.